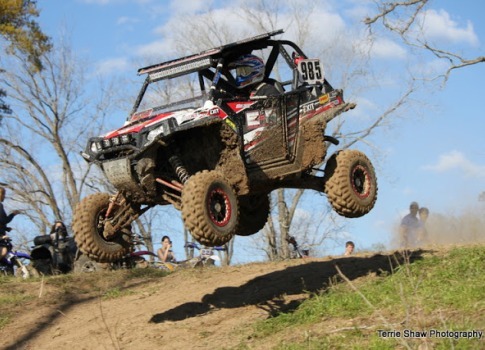 Double E Racing is a performance ATV and UTV parts and suspension company. Double E Racing is the creation of George White. We often get asked what Double E stands for. The answer is Ellis Earl. This was George’s late father’s name and George wanted to dedicate the business and race team name to him. George has over 25 years of ATV and UTV racing experience, not including his early days of racing MX on dirt bikes. George grew up on a motorcycle from a very early age; riding on the front of his mom’s dirt bike on trails before he could walk, then progressing to race MX, himself. He started racing ATV’s in 1988 and had a very successful amateur career, winning many races. From there he became a mechanic for Keith Little, one of the top ATV pro riders in the history of the sport. As Keith’s mechanic many races were won, including the 2004 AMA TT National Championship. He was involved in the Research and Development of products for many different companies, such as Hoosier Racing Tire, Custom Axis Shocks, Roll Design and EXIT Shocks to name a few. George is a Structural Engineer by trade and has always had a passion for racing and suspension. His belief has always been that no matter how much power you have, it does no good if you cannot put the power to the ground and make the vehicle handle. Double E Racing was started because of George’s passion for UTV’s and his relationship with Mike Hallock at EXIT Shocks. George has been working with Mike Hallock of EXIT Shocks since 1994. In 2012, together, they developed a suspension kit upgrade for the Polaris RZR XP stock FOX shocks. This kit started a trend in the UTV industry of rebuilding OEM UTV shocks which has become more popular with every new model released. Mike has since retired and George has continued working with EXIT and Zbroz Racing (EXIT’s Parent company) helping develop their UTV suspension products. Double E Racing is The Only Certified East Coast EXIT Shock dealer and service center. We offer a full line of shock service work; ranging from changing oil and seals, to revalving for your specific needs. We collaborate with EXIT Shocks on all revalving, so you are assured you will be getting top quality performance. We exclusively use EXIT Shocks proprietary semi synthetic oil. We also service brands other than EXIT, so ask us if you have a question. Double E Racing has many ATV Pro National wins in MX and TT under our belt. As a UTV race team, we won the 2013 UTV Rally Rally Raid Championship. As a company, we continue to pile up Championships (see our Accomplishments page). We have a ton of ATV and UTV race experience and understand the needs of racers and performance enthusiasts alike. Our mission statement is a simple one: It is our goal to give you the best equipment available to make sure you have an advantage on the track or trail.